The DetectX® Catalase Activity Kit is designed to quantitatively measure catalase activity in a variety of samples. A bovine catalase standard is provided to generate a standard curve for the assay. Samples are diluted in the provided Assay Buffer and added to the wells of a half area black plate. Hydrogen peroxide is added to each well and the plate incubated at room temperature for 30 minutes. The supplied Fluorescent detection Reagent is added, followed by diluted horseradish peroxidase and incubated at room temperature for 15 minutes. The HRP reacts with the substrate in the presence of hydrogen peroxide to convert the colorless substrate into a fluorescent product. The fluorescent product is read at 590 nm with excitation at 570 nm. Increasing levels of catalase in the samples causes a decrease in H2O2 concentration and a reduction in fluorescent product. 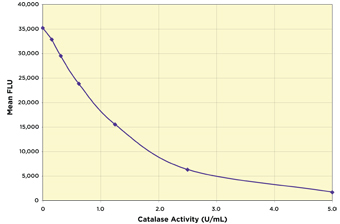 The activity of the catalase in the sample are expressed in terms of units of catalase activity per mL.